The City of Wanneroo will once again host the largest citizenship ceremony in the country on Australia Day, with almost 800 people set to make the pledge. Almost 3000 people will attend the ceremony at the Wanneroo Showgrounds on 26 January, including 785 new citizens from 63 different countries and their guests. Wanneroo Mayor Tracey Roberts said she was proud the City of Wanneroo was again hosting the largest ceremony, especially in a milestone year. 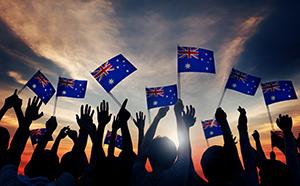 “This year marks the 70th anniversary since Australian citizenship was introduced into law, creating for the first time a legal status of being uniquely Australian,” Mayor Roberts said. “The City of Wanneroo is such a culturally diverse place, with 41 per cent of our 210,000 residents born overseas. New citizens and their guests will start the day with a barbeque breakfast, before being entertained with music by Challenge Brass Band and singer Bindhu. Mayor Roberts will present the City of Wanneroo Australia Day Awards to local community members who have made an outstanding contribution to the community, and Richard Walley OAM will perform the Welcome to Country. Adrian Barich will emcee the ceremony and inspirational Rishelle Hume AM, 2016 Aboriginal Person of the Year, will be guest speaker. Landsdale resident Ngoc Do is thrilled to officially become an Aussie, along with his two children Lucas (7) and Philip (5). Originating from Hai Phong in northern Vietnam, Mr Do left his home country as an 18 yearold to live in New Zealand and England before settling in Perth. “We love Landsdale,” Mr Do said. “Our family are very proud to become part of Australia. It feels so good. The northern coastal suburb of Jindalee is a long way from Venezuela. But for Patricia Castellano Chan the proximity to the beach and the fact that everything is brand new are just some of the things she loves about the City of Wanneroo suburb her family now call home. Mrs Castellano Chan moved to Australia six years ago with her husband, and is looking forward to joining her four-year-old daughter as a fellow Aussie. This will be the sixth year in a row that the City of Wanneroo has hosted the largest ceremony in Australia on our national day. “As the largest growing local government in Western Australia it is great to see so many people choosing to make the City of Wanneroo their home,” Mayor Roberts said.